What type of porch best suits you? Archadeck of Charlotte has a knack for building truly custom outdoor living spaces. From open porches, to screened porches, or combinations of spaces we offer many options for creating the best porch design for your family’s specific needs. Porch design carries many designations. Open porches are often also called covered porches, or covered patios. Screened porches are also commonly known as 3-season rooms. Each family has different requirements for the uses of their intended porch design. Some simply require a covered, airy space on which to relax, while others wish for entertaining capabilities and protection from insects. As your trusted Charlotte porch builder, Archadeck of Charlotte will deftly guide you through the planning and design process to arrive at your ideal porch. Charlotte open porches offer open and airy outdoor living. Open porches are outdoor spaces, where we can relax or entertain, while basking in warm breezes. Standards in porch design have changed over the years, as we have heightened our outdoor living aspirations. Realizing that porches aren’t just for sitting, we have implemented upgrades, such as ceiling fans, speakers, televisions, and fireplaces into our porch designs of today. 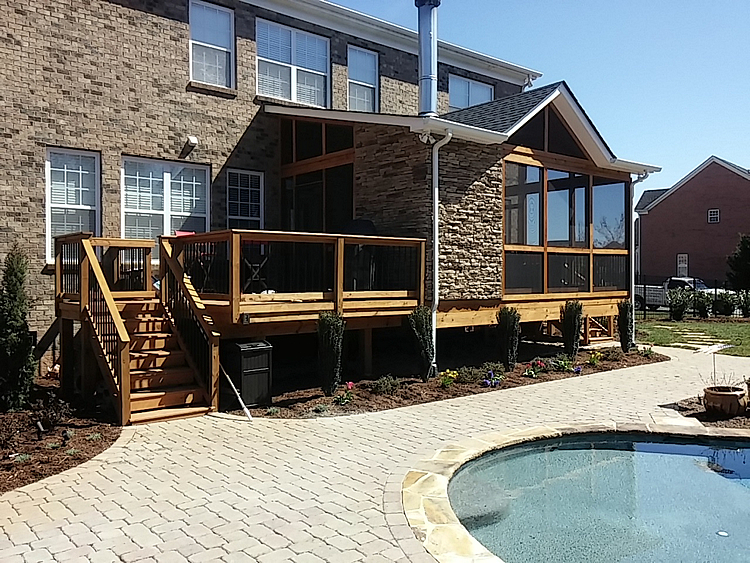 Whether your new covered porch will be used for private relaxation, entertaining, or a mix of both, Archadeck of Charlotte will give you the amenities required to accomplish your outdoor living goals on your new porch! This Piper Glen Charlotte open porch is not like the porches of yesteryear! 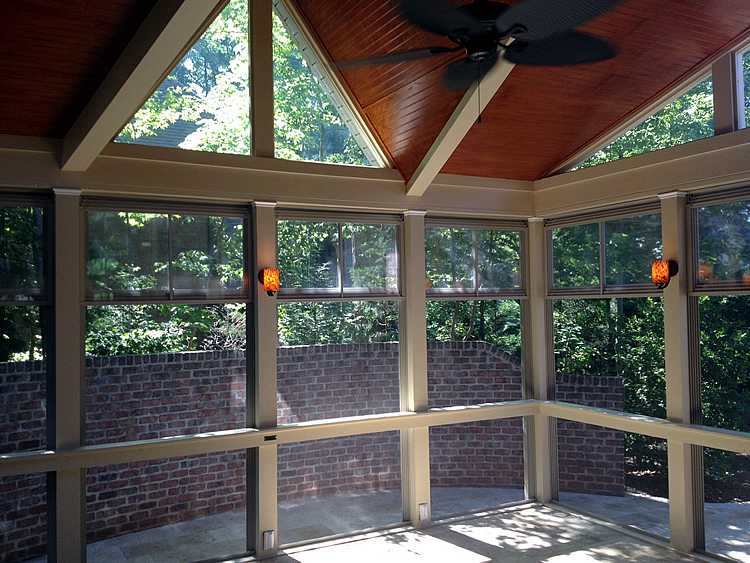 The gorgeous space above is indicative of the deluxe porches that we design and build for many of our clients today! This open porch is minus nary an accommodation with an outdoor fireplace, ceiling fans for cooling and warm air distribution, an area for conversation with loved ones or private relaxation, and enough room for two free-standing heating sources for additional hours in cool weather! Skylights are the literal cherries on top of this beautiful open porch design. Can you see yourself living in an open porch like this one? The beautiful covered porch design above includes modern day amenities, but still has a very classic feel! The porch swing and a small bistro table and chairs gives the air of porches past, while the dramatic gable design, skylights, and outdoor fireplace anchor it in the here and now. The porch is complemented with a paver patio design for truly open air outdoor living, where mild days will offer warm sun, breezes, and enough space for large get-togethers. Do you see a porch and patio combination in your future? 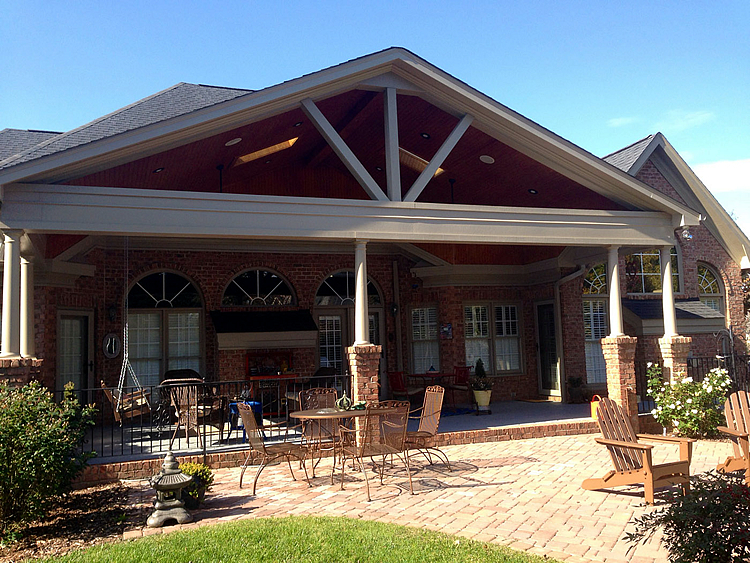 This incredible elevated covered porch offers a second living area underneath! No detail is lost on this custom covered porch and patio design. The beautiful space has rich cedar trim and ceiling, and the brick columns are a perfect match to the home. Ceiling fans will cool the spaces on warm days, and recessed lighting will allow for enjoyment after dark. Views from the upper level porch will be unimpeded by the low-profile black picket railings. Do you imagine yourself using two outdoor living spaces in different ways on different levels of your home? Add protection to your Charlotte porch design with screens! Screened porches are very popular in the Charlotte area, and with great reason. Screened in areas offer us added protection from insects, especially great for summertime evenings and nights, but still give us an open-air feel. Just like open porches, the screened variety comes in many forms. From classic and comfy to posh, Archadeck of Charlotte has designed and built all types of screened porches over the years! The screened porch retreat above offers poolside living, even when it’s too cool to swim! 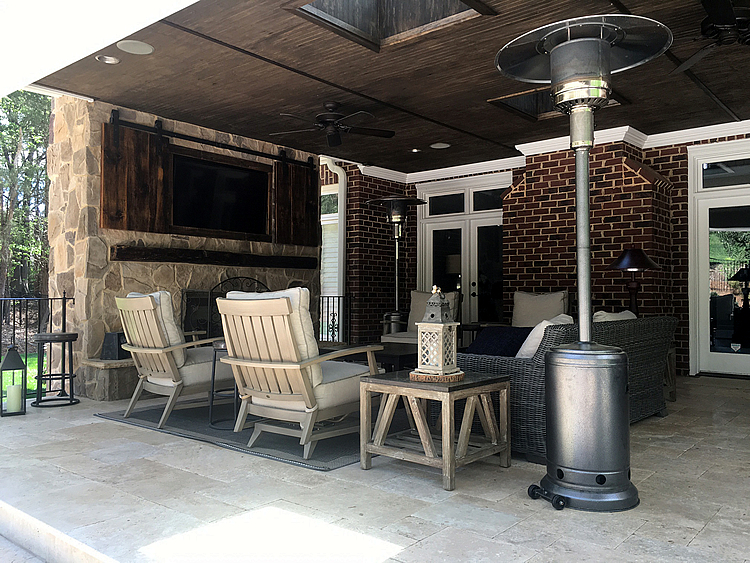 The screened area creates a private outdoor living space with a cozy outdoor stone fireplace, and is accompanied by a grilling/smoking deck for convenient outdoor cooking and eating. In season or out, this family now has a way to enjoy their backyard…without actually stepping into their backyard! 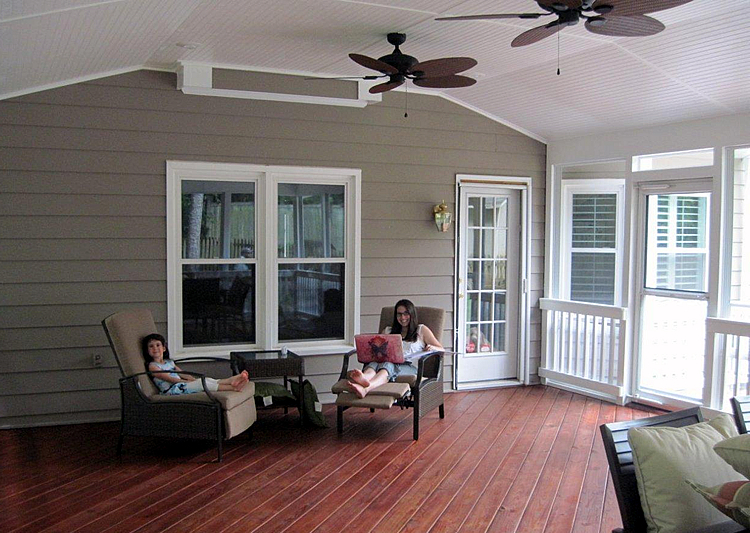 As the trusted Charlotte deck builder, we can expertly add a useful deck to your porch design. Do you think your poolside area would be greatly improved with a new screened porch and grill deck design? Want more time on your porch each year? Just add Eze-Breeze windows! During our colder days, even screened porches with fireplaces can become far too cold to comfortably use. If you want even more hours outdoors on your porch, just add windows! Eze-Breeze windows will turn your ordinary porch design into an extraordinary 3-season room. Windows can be opened in warm weather and closed in inclement weather and on cool days for ultimate protection in your outdoor space. For those of us, who long to be outdoors, even when it’s too cool, rainy, or breezy to be on your open or screened porch, Eze-Breeze windows are an obvious choice! Can you see yourself soaking up the sun in cool weather inside an Eze-Breeze porch? Eze-Breeze windows will turn your screened porch into a 3-season space! All porch design is not the same. Open porches, screened porches, and porches with Eze-Breeze windows facilitate different types of outdoor living. 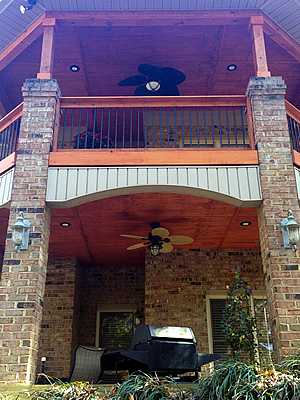 Porches with grill decks and walk-out patios give us better options for entertaining. No matter your outdoor living style, or design requirements, Archadeck of Charlotte will help you create your ideal in porch living design! Are you ready to plan your new open porch, screened porch, or outdoor living combination? Give us a call for a free design consultation at (704) 944-1350 or email us and a Design Consultant will contact you promptly.